there is the blockchain.info one for total supply but that very low resolution. I really was a graph of the actual new bitcoin mined on the market on a daily basis because it seems like a strangely elusive number given it's sigificance. I know it's somewhere in the region of 4300 BTC per day, and probably quite stable. The stability itself though would be interesting to chart because it's not going to be perfect. Failing all that, the blockchain has this information in it doesn't it. Perhaps I'll have to figure out now to plot it. This iterates over all days since the block reward halving day (2012/11/28) and counts the blocks that have been mined on that day. The following plot shows the number of blocks per day. Multiply that by 25 and you get the daily supply of bitcoins entering the system. Notice that the notion of day depends on the timezone you're in, and blockchain.info appears to use GMT timestamps. Also blockchain.info uses the timestamp included in the block, which might be off for up to 2 hours, but that should even out in the long run. You can find the script and data here. 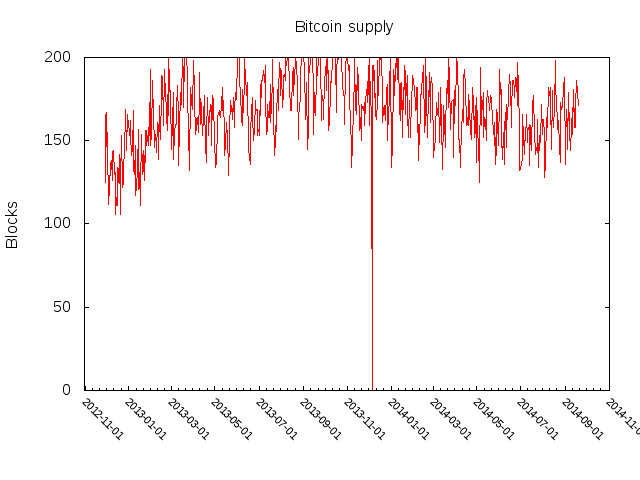 Such a graph would be fairly boring I presume as the supply is currently 25 BTC per 10 minutes. It's true that there's some variance and another factor is that it's actually 25 per a little less than 10 minutes because of the growth in hashing power. Bitcoinwisdom.com has a graph that shows the average time between blocks which is inversely proportional to what you're asking. Not the answer you're looking for? Browse other questions tagged blockchain money-supply shrinking-money-supply or ask your own question. Where on the web can I find out the current total blockchain size? Where can I find records of blockchain branches?